One of my favorite days of the entire year! Of course, my 6 year-old son has decided that Valentine’s Day is yucky, all of the sudden. But I’m not going to let him dampen my lovey-dovey spirit! 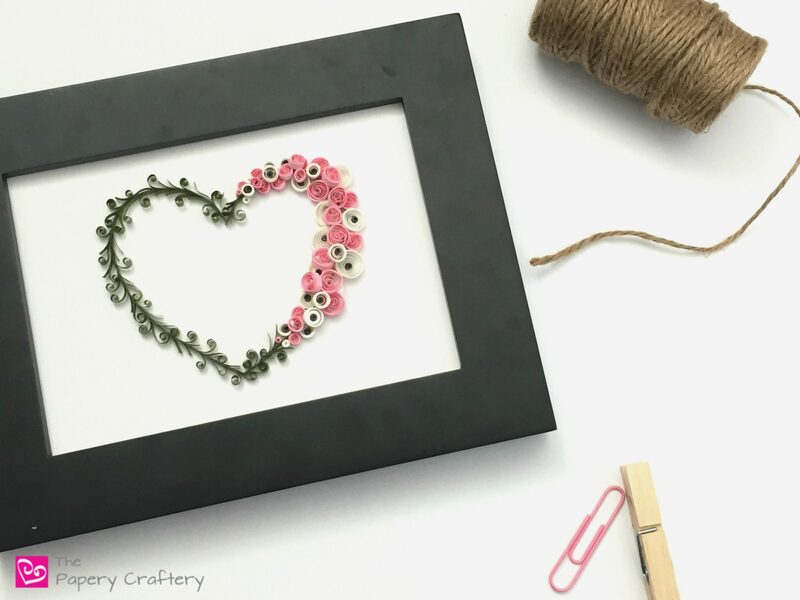 This week, I’m sharing how to make this quilling paper flowers and vines heart. Even though they’re pretty simplistic shapes, I went ahead and made up this heart template. The one I’m demoing is the top heart and the smaller of the two. After printing, place the heart of your choosing on your workboard and cover with wax paper. The first step to the flowers and vines heart is to complete the edge. To do so, glue two strips of quilling paper together to make a double-thick strip. If you need a refresher on my on-edge technique, check out the post I just made on quilling paper mittens. After your edging is complete, start adding the vines. The vines are created from basic scrolls. The trick is to place them in random order and to make sure they’re not in the same through the entire design. Tuck in some curved strips as well for a little variation. In case you’re wondering, for this heart I’m using this leaf green paper. It’s one of my favorite greens! I made two different kinds. For the first, tear strips of white quilling paper in varying lengths, from about 2 1/2 inches to 6 inches. Instead of rolling the strip around my quilling tool, I used a toothpick to make the center hole slightly larger. Then, fill in the center with a tight coil from a charcoal gray strip. The result is a bold, graphic anemone bloom. For the pink flowers, I experimented a bit and came up with a way to make coils look like roses. After rolling strips of pale pink around my needle tool to make a coil, I glued the end. Then, using my tool, I pushed on one side of the coil gently. I think they sort of look like ruffle-edged rosebuds! The result is a mix of modern quilling with traditional swirls. There is no real rhyme or reason to how I placed the flowers. Just layer and move them as needed, until you’re happy with the placement. I’d also add a few white and pink tight coils at either end of the spray to add a more realistic effect of blooming flowers. Then apply glue as needed. TIP ~ If you’re worried about not being able to get your flowers just right when you start to glue, think about snapping a quick photo to reference as you work. I was looking for a cascading effect, and I really like it! I know it’s too late for this Valentine’s Day, but this heart could be made anytime. Try it for a Mother’s Day card, or a birthday. Experiment with other flowers like these mini daffodil blooms, or maybe add a tiny ladybug, too. Whatever the occasion, this quilling paper flowers and vines heart is simply pretty. I’m so happy to see a true professional showing her quilling techniques….I used to quill about 20 yrs.ago & just decided to try again! I am 70 now but I made everything from cards to jewelry ! Thank you so much! What kind words, Valerie! I’m so glad you’re quilling again. If I can ever help with anything, feel free to reach out. Thanks for stopping by. Happy Valentine’s Day! Thank you so much, Meredith !! Happy Valentines Day to you too ! I’m so excited that I found your site. It’s so easy to follow and your pictures help tremendously!! I’m a new quiller and just loving all the different shapes I’ve started experimenting with. I’m wondering how best to make a single letter so it stands up well. I’ve tried to follow a few tutorials and all mine flop or don’t look very stable. Any suggestions on how to make them look more professional? Hi Pam! So glad you’ve found my site! I think you’re asking about making the outline of your letters straighter and more stable, right? If you’re set on using the standard 1/8” quilling strips, doubling them up like I demoed in this post is really helpful. You can also change up the paper for your edge work and use card stock strips instead. They are much thicker. And straight pins are your friend! I use them in every corner of my monograms and along both sides of the straight bits too. They really do help keep everything in line. Thank you Meredith for responding back. I will try doubling up the quilling strips first and see how that works and practice a couple of letters! I just got a small paper cutter so I can also try cutting my own card stock strips….. I hadn’t thought of that, so thanks again. I’ll let you know how successful I am..
Second i have two questions, what kind of paper do you use to stick your work into before framing it? I mean the white paper in back? And how can i harden my work? White glue will disappear or not? I read your glue topic but i can’t find clear glue! That’s so kind, Safa! You’ve made my day! I have also found that running the 1/8 strip through a paper crimper makes for an interesting and very stable letter. It also helps with the bends and turns so many letter have! Totally agree, Sharon. I wrote a post last year about using a crimper and I had so much fun playing and figuring out new ways to use it!